So one of the last minor details to finish in the bathroom was installing a door. I say minor, but apparently a few friends that have been over seem to think it’s a big deal. And I’ll admit, having the cat watch me every time I visit the bathroom is a little uncomfortable. 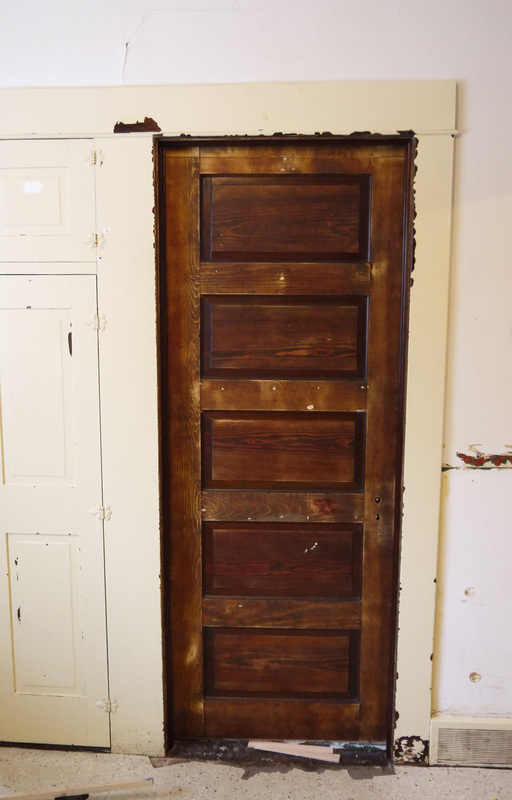 I salvaged several doors before an old brick building was torn down early last year. They spent the first winter in my mom’s garage until I moved them here, and I knew I’d be able to use a few of them. 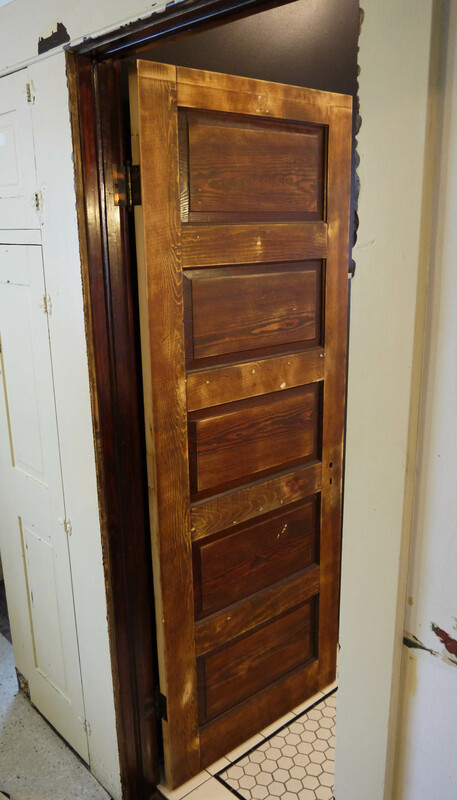 Sure enough, only 1 is a 5-panel wood door and it’s the perfect width for my existing bathroom door frame. I trimmed an equal amount off the top and bottom of the door (about 1.5 inch total) and it now is the perfect height. Unfortunately the hinges on the existing door frame and the salvaged door don’t line up. I figured it would be best to change the hinge placement on the door since it’s in the garage resting on saw horses, and easier to conceal the old hinge mortices. Plus this way they are equally spaced from the top and bottom of the door frame. However, it’s been a little cold in NW Ohio, so I ended up with the door on my dining room table instead of in the garage. I used small blocks of wood to fill in the old hinge mortices, cutting them slightly thicker and glued them into place. Once dried, I planed them down flat with the edge of the door. It was a little snug in a few spots, but it fit! This photo looks like there is a large gap under the door, but it’s because the door hides the transition from the existing kitchen floor to the 1/2″ higher bathroom tile floor. 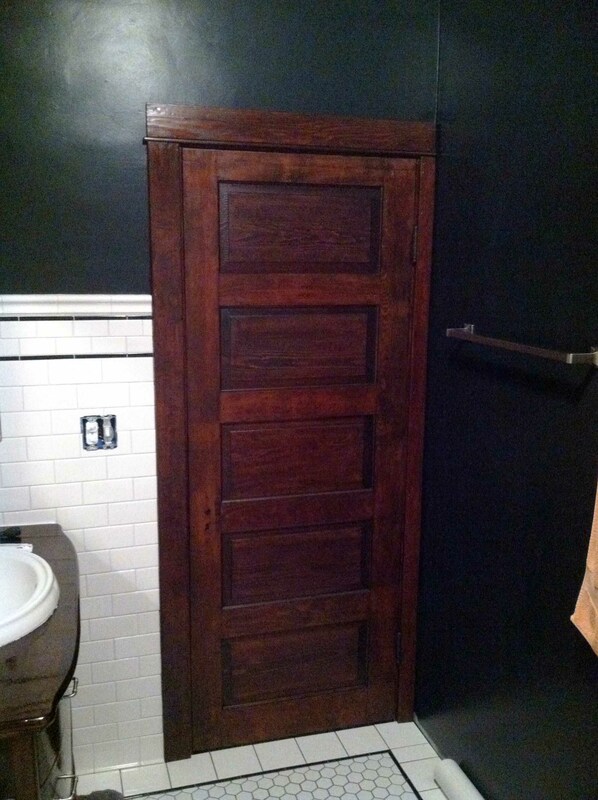 When the door opens into the bathroom, it’s a very natural space between the door and floor, probably about 1/4″ or so. I took the door off the hinges again and carried it into the garage for one more round of sanding, hitting the tight spots and making sure all the wood filled spots were smooth. In total, I think I carried the door in and out of the house more than a dozen times. 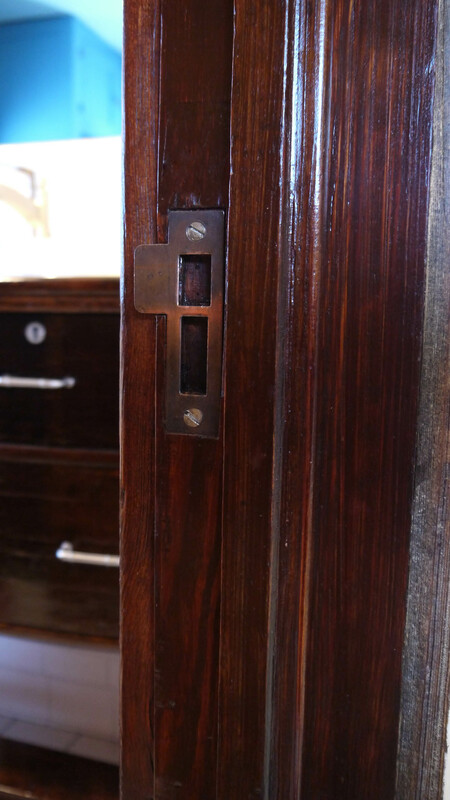 By re-inserting the handle mechanism, I marked on the door frame where the strike plate would need to go. It took me a little longer to chisel out this space, because the strike plate needs to be flush with the wood and the center needs to be chiseled deeper to make room for the latch to spring out. This picture was after I reattached the door stop also, so the door closes tightly and latches without rattling against the stop trim. Then it was stain time. I wiped down the door really well with a slightly damp cloth, making sure to remove as much dust as I could. Giving the door plenty of time to dry I started staining the door with a clean cloth and the same Minwax Mahogany Gel Stain. The door accepted the stain really well, but with gel stain it takes a little technique to achieve a good look. 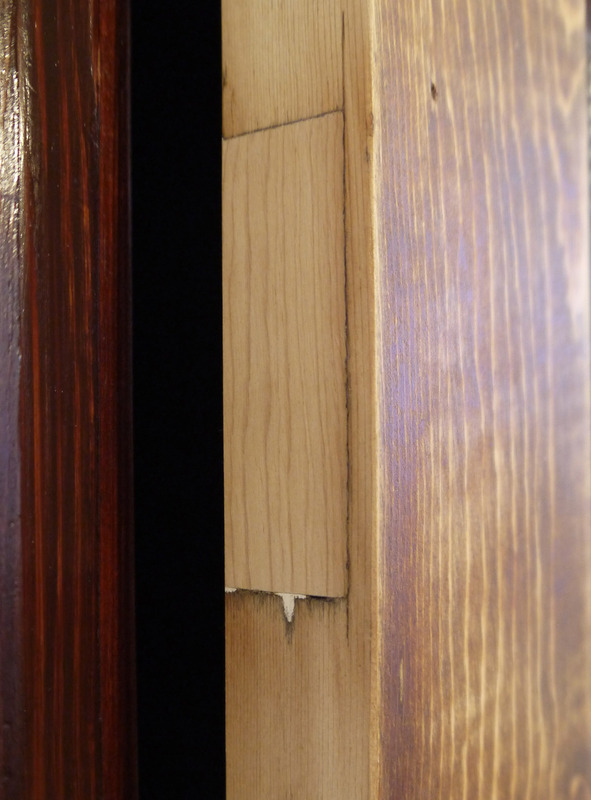 Especially in the lighter wood areas or where the wood filler was really thick, I wold try not to wipe off all of the stain to help even out the color. I might hit a few light spots with a second coat of stain, but otherwise the door is ready for 2 coats of poly. 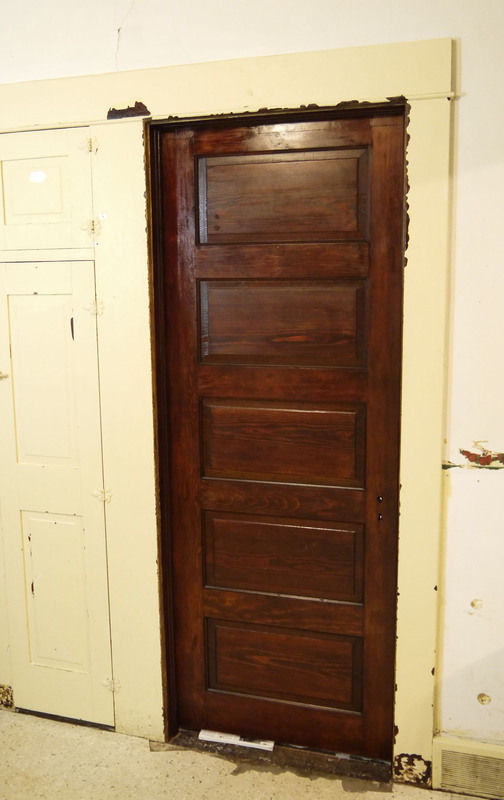 The contrast between the untouched kitchen woodwork and the now-beautifully stained door and frame is unnerving. I find keep finding myself staring at the door and how rich the color looks, trying to imagine how the rest of the woodwork will eventually look. On the inside of the bathroom I nailed up the door trim that’s been waiting in the corner of the dining room. It’s finally starting to look finished – and then I realize I still don’t have outlet covers, lol. 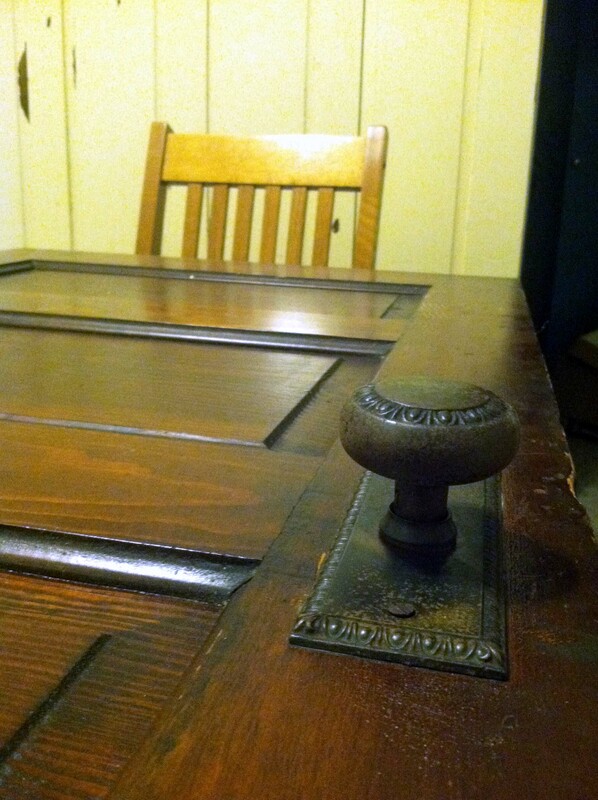 This entry was posted on March 3, 2015, 10:38 PM and is filed under DIY, Home Improvement. You can follow any responses to this entry through RSS 2.0. You can leave a response, or trackback from your own site. Looks fantastic Adam, like I knew it would. Can’t wait to make it over to see in person.